On a good axle there is a bad thread. Can I cut a new thread like a 9/16 -18 . What do you think?? I read on the Model A site that they took the tire off, started the car and ran it so you had a Model T "lathe". while the axles were turning they took a file and filed them down to ? (can't remember). Then they re-cut new 9/16ths threads. The originals were 5/8ths and the new threads they cut were 9/16ths. My Model A has the 9/16th threads on it so while I do not know how common of a practice this is, it did and probably still does happen. If you have the axles out and turn it down in a lathe I can't see why it wouldn't be OK. 1/16th in diameter is only .0325 on each side. I would think good 9/16ths threads are better than bad 5/8th. I agree with Stan. Not sure how close Metric threads are.....but that is another possibility. The bottom line is, You want to keep the wheel hub tight. 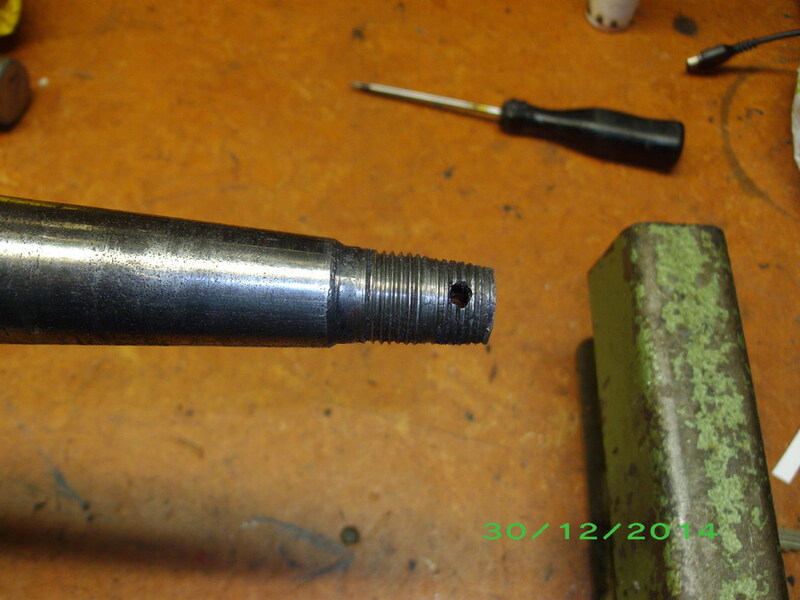 I have filed down and re-threaded a Model A axle on the car. My first choice would be, if the rear end is out, to replace the axle. If that is not feasible then go with the re-thread. If it were my car, I wouldn't do it. The thing is, it's not a good axle with bad threads. It's a bad axle. Is it any different than a good axle with a bad keyway, or a good axle, except for a small crack? I don't think the welding is a good idea unless you have it re-tempered, doing the nut up would more than likely just snap the axle thread off. I would not weld on the axle nor would I turn or die threads on the hardened part of the axle. The threaded area is not hardened. I see nothing wrong with threading it a size smaller if the rest of the axle is undamaged and usable. There's about a 20% difference in clamp load due to tensile stress area and reduced torque but there's no sheer force present except at the threads. As long as the tapers (axle and hub) and keyways are good, you should be alright. If the rear end is apart get a new axle. If you want to repair an axle that's in the car, then go with the 9/16 thread but put a new axle on your to do later list. Anthonie, just don't take any one you love for a ride!!!!! This operation has been performed many times.